Tony Williams is a United States Air Force veteran who has served the Air Force as an active duty member for 20 years, and has been a civilian employee for the past 11 years as a Human Recourse Information Systems officer. In addition to his civilian employment, Tony also ran several non-profit sports organizations. He is married to Shelley Price-Williams and has three children. 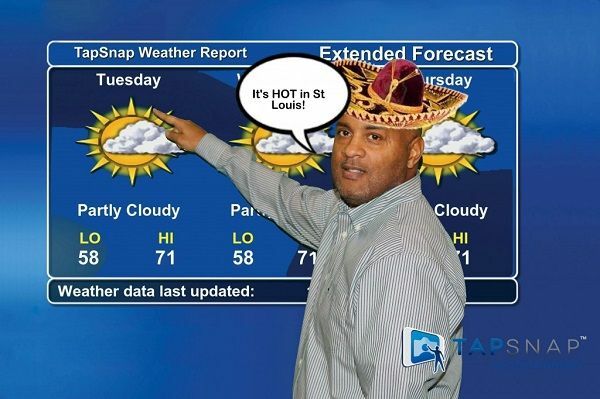 Tony’s oldest son, Tony Jr. will be joining the TapSnap team as his Operations Manager. His daughter is now serving in the Air Force, and his youngest son is in his third year of college and will be commissioned into the Air Force upon graduation. Not only are they are a military family, they are also now part of the TapSnap team as owners of TapSnap 1151. Interesting that you ask. When I started this journey about 2 years ago, I was looking for a part-time business to fulfill a lifelong dream I had of owning my own business. After the United Air Force for over 30 years, and running a youth football league for 6 years, I finally decided it was time for me to do something for myself. “Now is the time”, I said to myself. I looked in many directions and I completed a ton of research before I finally decided TapSnap was for me. TapSnap presented an opportunity for me to earn a living while having fun with something that was really cool. The second reason was that TapSnap allowed me the freedom to be me. I could set my own schedule and determine my own outcome. I like the flexibility that TapSnap allows. The most important reason for choosing TapSnap was my sales rep, Bob Gallner. Bob was a great guy; may he rest in peace. I really felt comfortable with him. I must have talked to eight other franchise opportunities before deciding on TapSnap. Ultimately it was how comfortable I felt with Bob and the trust I gained from the relationship. Trust is everything to me and ultimately I made the right decision in choosing TapSnap. I like the franchise model and I wasn’t looking to invent or reinvent something. My goal was to select a business opportunity already developed and perfected, and to follow that model to greatness. I am a firm believer in that if you want to be successful in life, you should surround yourself with successful people or partner with an organization that has proven its model works. This is why buying a franchise was a great option for me. What were you doing before you decided to become a franchise owner? I retired from the United States Air Force (USAF) as an active duty member in 2005 and I have been working as a civilian employee for the USAF since then. I have also been a mentor and volunteer coach most of my life. I spent the previous six years running a youth football program and serving on the league board. It was about two years ago when I decided to walk away from the football program and pursue my dreams of being an entrepreneur. It was a natural transition for me as I had already developed the skills to manage a business. I was already used to working long days and weekends. My challenges were learning how to navigate the industry. I really thought it would be easy, but at times I questioned why I decided to do this after another long work day. It took some reflection on my part and I realized why this meant so much for me. Once I truly realized why this opportunity meant so much to me, it became easy, and the things I once considered as challenges became minor speed bumps to the ultimate success I want to achieve. During this process, I decided to join industry organizations and I served on their committees. It has paid off. Now, I am a part of the industry and the earlier challenges or barriers I faced are no longer there. What are some of the most positive experiences you’ve had as a TapSnap franchise owner? It is really awesome to see how happy we make people with TapSnap! It is really exciting to see that this great product has solved many challenges for our clients that have hired us for marketing events. It’s also amazing to see the excitement surrounding the great pictures we take at weddings, social events, and holiday parties. I would have to say the most positive or rewarding experiences for me are being able to provide a product that truly adds value to an event for a client. Holiday parties by far are my favorite events. We almost always do a green screen for holiday parties, and one my favorite features of the TapSnap experience is digital props. I have a ball with creating very fond memories for guests with the digital props. Holiday parties allow us to be so creative with physical props as well as the digital props that TapSnap has to offer. This year we will add the Animated GIFs to the FUN, and I am really looking forward to what we will produce as a result. Confidence. Believing in yourself is so important. Most of us, I would say, felt afraid or lacked the confidence to make a sales call. I felt if I told someone how much it cost, they would automatically say no, and they did. Here’s the thing… They said no, because I lacked the confidence to sell this great product. The price was never the problem. I didn’t believe what I was selling was worth what I was asking them to pay. Lack of confidence was all over my face. It is a completely different story today. What has changed is that I now have the confidence to stand before anyone without hesitation and say here’s what it costs and, most importantly, why. I have learned to do this in 30 seconds or less. What has changed is that I have learned to listen to the client and not try to sell them on every great feature that TapSnap has to offer. Listening to the client and then making my sales pitch with utmost confidence is what has changed for me, and it is making a huge difference. I learned to listen and I learned how to manage my time. Time management is still difficult at times working another full-time job, but it is getting better. Now my oldest son will be joining the team as my full-time Operations Manager and he will bring a different dynamic to the team that will allow us to grow even more. If I had to do anything differently, I would have employed my son from day one. I mean, I was doing everything alone. My bookkeeping, graphics, sales, bookings, networking, meetings, contracts, events, and so on were all my responsibility. It starts with a team concept. TapSnap is special because we have a corporate team that is very supportive of us. We have a great team of franchisees who share best practices, ideas, success stories, and who will go out of their way to help a fellow franchisee. That is special. TapSnap is also special in the events and marketing industry because of our unique tool sets, such as our fully-customizable social media photo booth and SnapCast, our social media wall. People love TapSnap because the kiosk is clean, sleek, and provides a new, but familiar look. TapSnap is special because we can do things others in the industry simply can’t and it is important that we stay ahead of the curve to continue to deliver an outstanding product to the special events industry that is second to none. My secrets to success are persistence, listening, networking, membership in industry organizations, establishing partnerships with venues, and connecting with industry professionals. Studying the industry via brides, planners, and marketing professionals has also gone a long way. It is important to understand what they do so you can frame your sales pitch to their needs and what they want from their event activation. Understand that you don’t have to sell every TapSnap feature at once. Listen to your client and they will tell you what they want or need. Learn how TapSnap works and use that information to make a sales pitch based on the client’s needs in 30 seconds or less. Their attention span is very brief because they are very busy. The best piece of advice I can give any new franchisee is to find a TapSnap mentor. Don’t be afraid to contact another franchisee and pick his or her brain after TapSnap training and learn what you should do on day one and beyond. To me it is an absolute must-do. You should strive to learn. Don’t try to do this alone, and don’t try to reinvent the process. Lastly, you must market TapSnap, but more importantly, you must market yourself. If you'd like to learn more about franchising with TapSnap, download our Franchise Information Report, or give us a call at 1-877-577-0566!